Here at National Range Cookers we strive to bring you exciting new and updated cooker ranges whenever we can, and today we are pleased to bring you news of our stunning Italian-designed SMEG products. We have expanded our range of cookers from the popular Victoria, Opera, Symphony and also Portofino ranges. For extra peace of mind when purchasing a SMEG range cooker, we can now provide an extended warranty on selected SMEG lines, making National Range Cookers one of only a few retailers in the UK to be able to offer this to our customers. Victoria – Classic in its 50’s traditional styling and design, the ever-popular Victoria range is available in a wide range of sizes and colour tones to compliment any kitchen. Opera – Ideal for a spacious kitchen, this unique cooker range has a robust design that brings style to your home and is built to last. If you have the space, then this range has sizes that include an impressive 150cm wide unit. Symphony – Clean lines and sophistication are the standout signatures of the SMEG Symphony range. Colours include black and stainless steel to give your kitchen that professional finish. 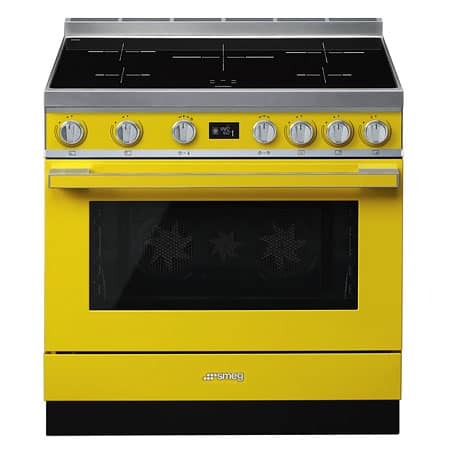 Portofino – The Italian Riviera inspired Portofino range is new to the SMEG line-up, and we are confident that one of these 8 brightly coloured cookers will make a bold statement in your kitchen. Features for these cookers are some of SMEG’s most advanced to date, including LCD display, 3 fans, 5 cooking levels. These cookers can be set up as free standing or built-in to your existing kitchen layout. For more information on the superb SMEG range take a look at our cooker section, or call our expert team today on 01902 717890.